The Kingdom Bunyoro Kitara was a very extensive, prestigious and famous at the height of its power. Socially, people were organised in strong clans with the royal clan of the Kings, princes and princesses. The King held executive, judiciary and legislative powers. His word was highly respected and almost equated to the word from God. The King’s subjects ensured that their King lacked nothing economically. Clans would bring food stuffs (Ebihotole) in turn and each clan had a specific duty to perform for the King. For example, Abaliisa clan were the shepherds of the Kings cattle (Enkorogi), the Abahamba clan were the hunters and body guards (Abakumirizi) for the King, the Abasiita clan being the artisans and craftsmen and the Bayaga clan were the chief entertainers of the King. Politically, the King had absolute authority over his subjects. He appointed the county chiefs (Abamasaza) to administer each county. Bellow them were sub county chiefs (Abagomborozi) who were sub-county administrators. These received reports from parish chiefs (Abemiruka) and Sub-parish chiefs (Abatongole). At the very grass root were the village chiefs (Bakuru b’emigongo). With this hierarchical arrangement the king’s messages used to reach at the grass root very fast. Later on the office of the Prime Minister (Omuhikirwa/Katiikiro) was established to head the civil service of the entire Kingdom. All county chiefs report to him and he in turn reports to the King. Economically, the Kingdom of Bunyoro was the supplier of food stuffs to other neighbouring kingdoms. The fertile soils of the kingdom enabled people to grow plenty of food for home consumption and the surplus was sold to the neighbouring communities. People’s economy thus was greatly hinged on Agriculture carried on using traditionally made hoes. Barter trade was also common. The people along Lake Mwitanzige (Albert) known as the Bagungu were fishermen. Some communities were hunters using nets, knives and spears as their locally made tools for killing small animals while the big ones were killed using well dug deep pits (Obuhya). People thus exchanged fish or dried meat (Omukaro) with food stuffs. The coming of the Bachwezi introduced the culture of cattle keeping on a larger scale with their long-horned cattle which yielded more milk. Salt processing in Kibiro is still going on up to today. The Abanyakibiro got their living through the exchange of this salt and fish. The Banyoro also produced a number of wooden items, hides and skins items, palm and sisal items, iron and stone items, pottery and mud items, and many others on economic basis. These were either sold or exchanged for other items that they needed. 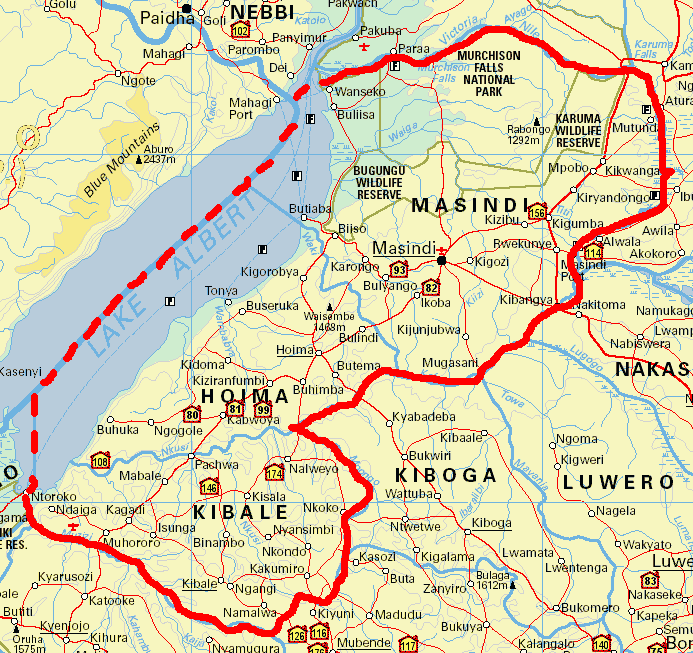 According to 1997 projections, the total population of the Bunyoro-Kitara Kingdom is between 800,000 and 1,400,000 living in 250,000-350,000 households. 96% of the population live in rural areas, and only 1% of the population uses electricity for lighting and cooking. More than 92% of the population are poor, and has earnings more than half that of the Ugandan national average, and about 50% of the population is illiterate (sources: Wikipedia). The economic potential in the region is very large, with the Kibiro saltworks, and the possibility of large oil, gas, iron ore and precious stone. During the first decade of the 2000s, sizeable deposits of crude oil have been discovered in the area. The area also has large rainforests with an abundance of hardwoods including mahogany and ironwood.